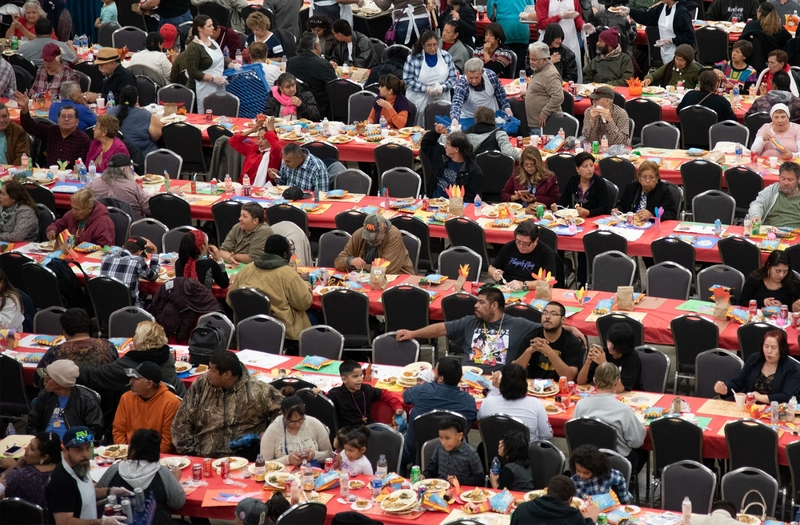 Some who come to the Raul Jimenez Thanksgiving Dinner prefer to eat alone. Or, maybe they’re shy and aren’t good at socializing. 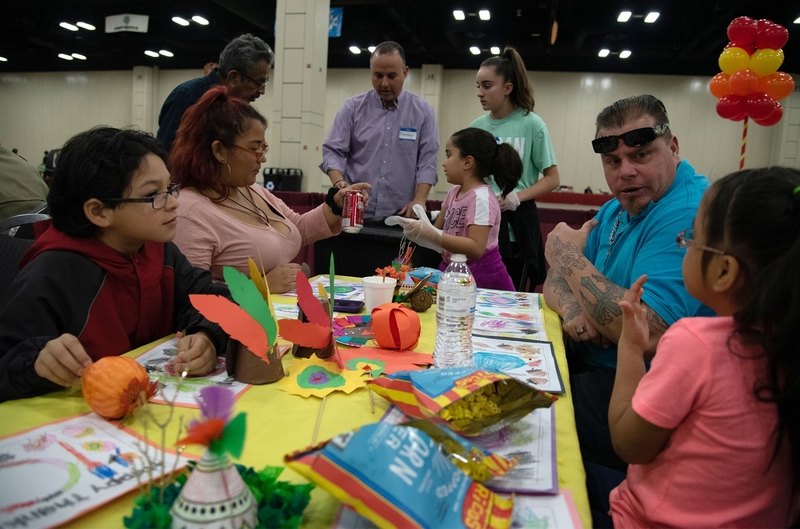 Others bring the whole family to the Henry B. Gonzalez Convention Center every year. 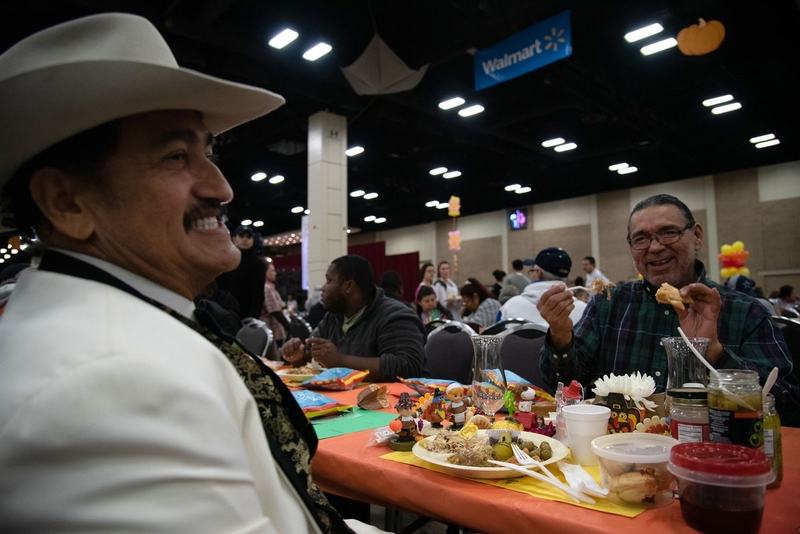 Then there are people like Robert Torres and Cesar Laijas, both in their 50s, who met each other at the dinner in 2014. They’ve claimed the same area—on the far end of the cavernous setup from the entrance—where they have more elbow room. Torres needed the extra room for his additional condiments and several turkey and pilgrim tchotchkes he arranged as his own personal table setting. The whipped cream, in particular, became very popular among his buddies when the pumpkin pie servers came around. All in Torres’ family in San Antonio have died. He has some aunts and uncles, but they live out of town. On this day, people like Laijas have become his family. “There’s not a place to take a nap,” Laijas said while laughing. 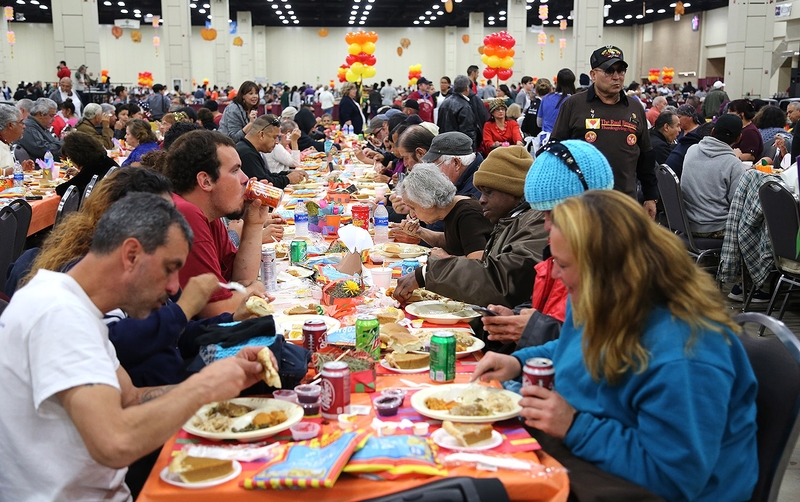 Every year, the Jimenez dinner, which started in 1979, serves an estimated 25,000 people at the convention center. 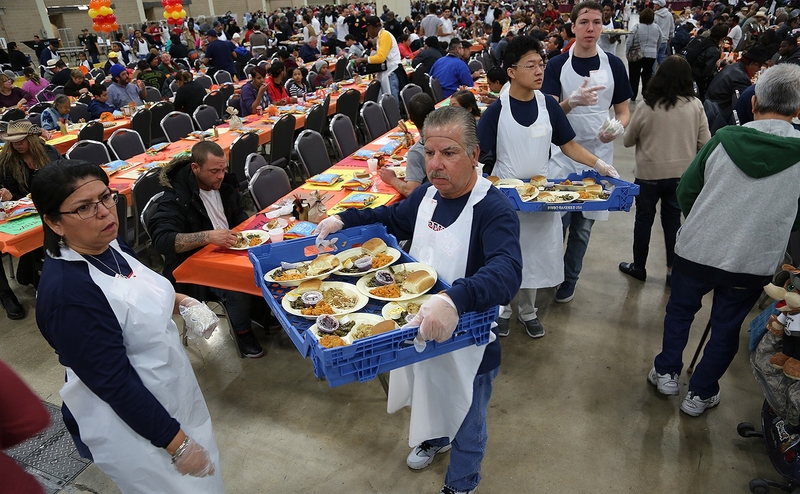 More than 4,000 volunteers make the well-oiled machine go. 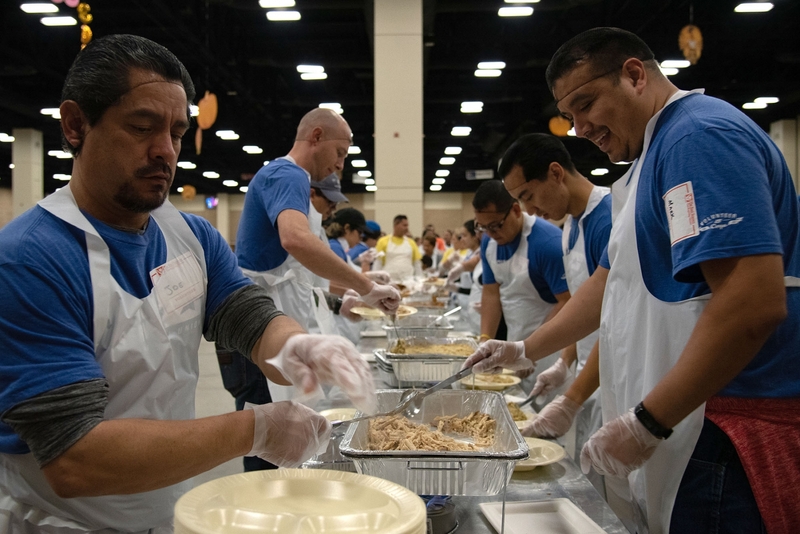 There are volunteers who assemble the plates. 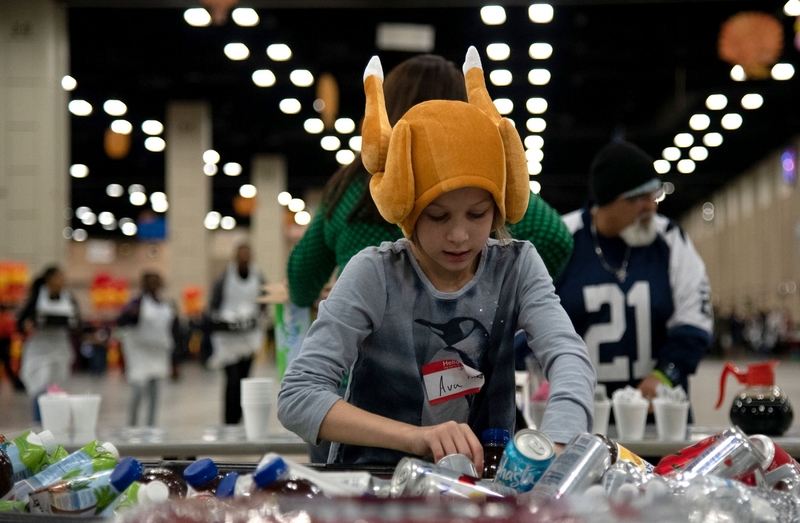 There are those who push around trash cans and recycle bins to keep the rows upon rows upon rows of tables tidy for the continuous stream of people. 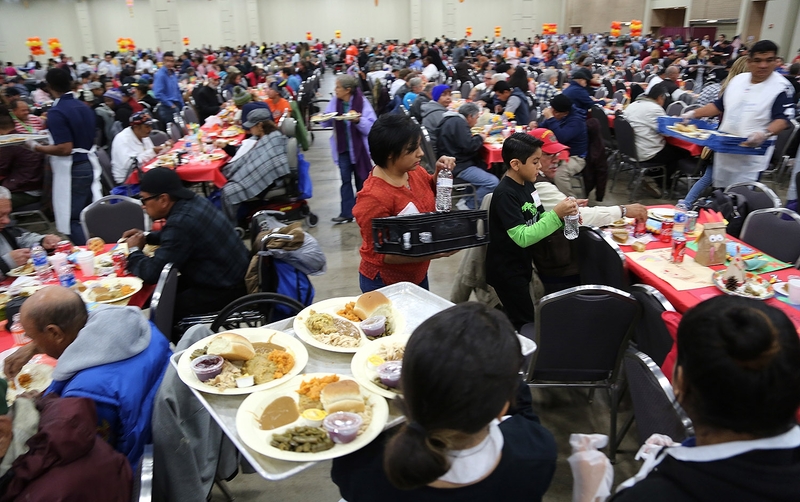 The glamorous job goes to the volunteers who carry around the actual meals on large treys and bring them to the hungry. Some just walk around with hot coffee. Then you have volunteers like Michelle Rodriguez who’s job is to walk around and ask people what else they need. If you’re a guest at the Jimenez dinner, you’re allowed to have as many meals as you like. 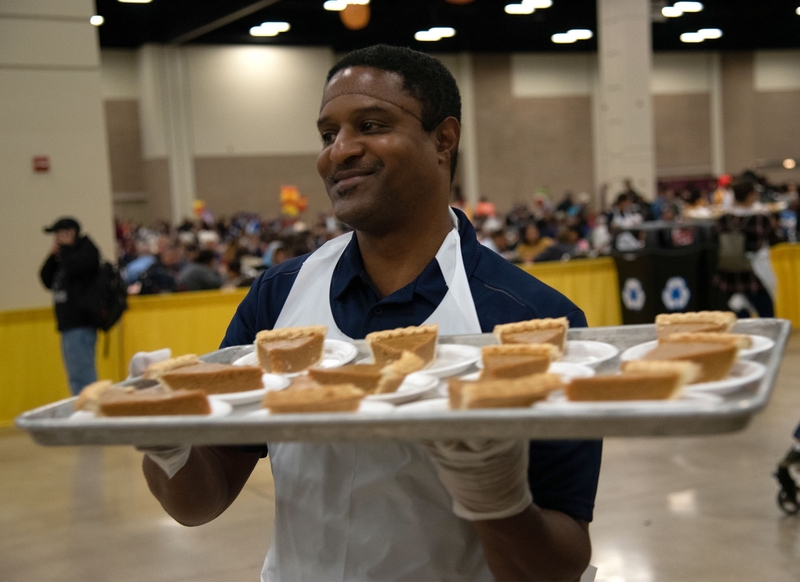 Rodriguez’ job was to identify those who needed pie. But at times, she looked bored. 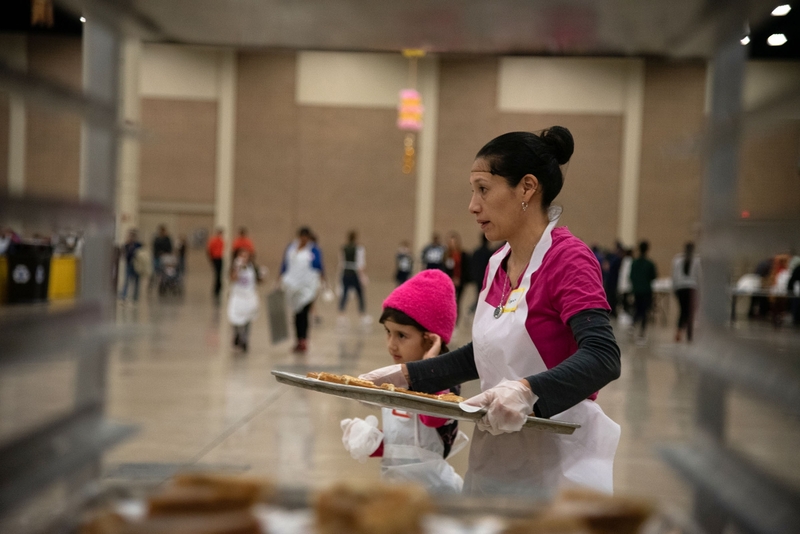 “There are so many volunteers, everybody is on top of it,” said Rodriguez, 45, who helped out on Thursday with her mom and son. 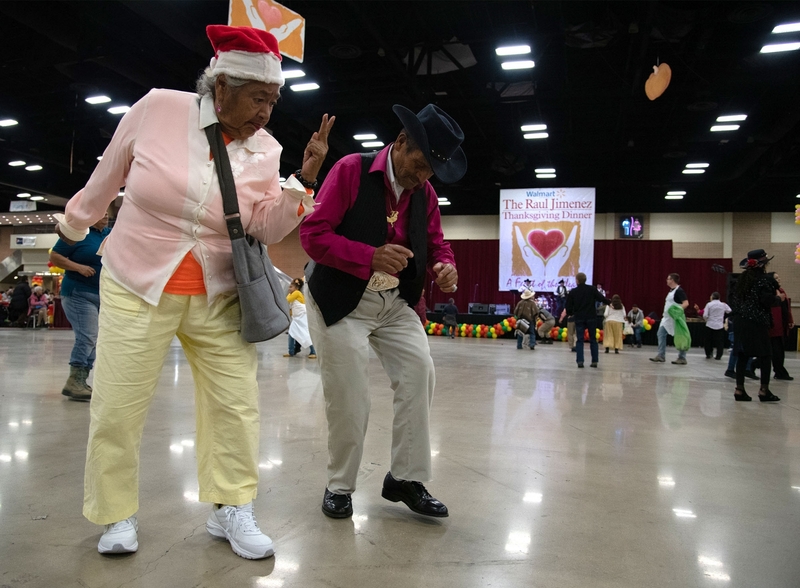 Gina Gomez, 43, comes to the dinner every year by herself for the music and to meet new people. It means not having to do dishes at her house. Later that evening, she would go to her mom’s place, where the rest of her family would gather for the dinner. Thank you for this touching article that shows the warmth of people coming together. I’m inspired to volunteer in the future. Happy Thanksgiving, Ben!